Pat and Rima Pathare and Ronald Reddy and Anjeni Devi take a break while working at the Academy for Gifted Education in Takapuna. CrestClean is attracting a new generation of motivated professionals keen to have more control of their working lives. High-achievers who have bought a cleaning franchise have included accountants, software designers, solicitors and people working in banking. Caroline Wedding, CrestClean’s Auckland West Regional Manager, says the cleaning industry is fulfilling the dreams and aspirations of young people who want to run their own business and get ahead with a new career. Caroline’s been particularly impressed by the work ethic and commitment of two couples who joined CrestClean last year. Pat and Rima Pathare and Ronald Reddy and Anjeni Devi have made a big impression with their customers, she says. Both teams have achieved a Certificate of Excellence for the high quality of their work. The awards follow direct feedback from their customers. 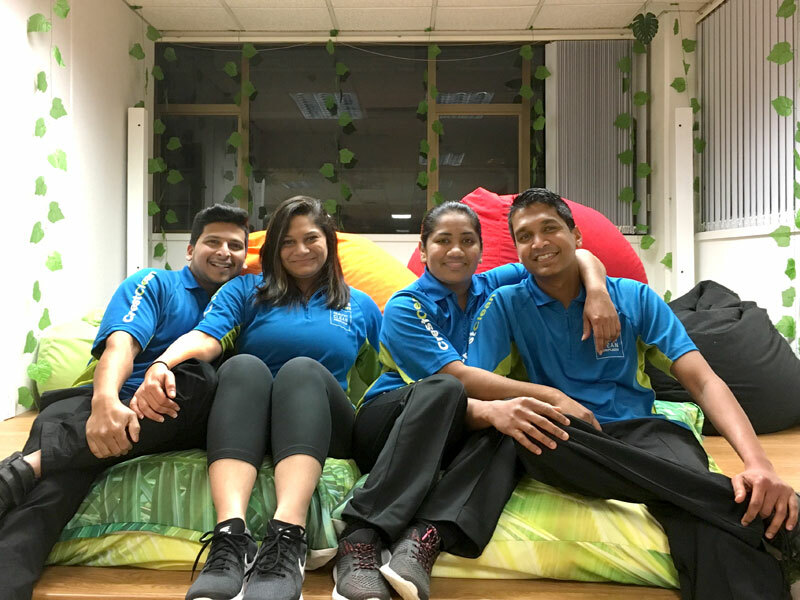 “Both are young married couples who have CrestClean businesses and are working hard to carve out a secure future for themselves rather than just spending their nights in front of the telly. “They are an absolute credit to the CrestClean brand and do a fantastic job for their customers. “They come from customer service backgrounds, are very professional in their approach and they are motivated and committed. They are a new generation of CrestClean business owners who have already been successful in other careers before joining us,” added Caroline. Pat is a fulltime customer services officer for ASB while Rima works in lending administration for ANZ. After finishing their day jobs, it’s a quick change as they put on their CrestClean uniforms and head off to begin cleaning for their customers in West Auckland. Customer satisfaction is key, he says. “I have really good customers and they are happy with our work.” A key factor in a successful business is establishing good communications with customers, he says. The support and training that CrestClean provides has been invaluable, he says. “It also helps me learn about running a business. Even on a small scale, I’m learning about the ins and outs of business, which I never knew about,” says Pat who is considering turning their business into a fulltime commitment. The couple, who are planning to become home owners with the extra income from their business, have been impressed with the help and guidance they’ve received from Caroline and her team. “If you follow CrestClean’s procedures then nothing is difficult. The support I get with the franchise from Caroline is really good,” he added. Ronald, an accountant, who works as an admin manager at a Palmers garden centre, says their CrestClean business gives them extra income, which they’ve put towards buying a house. Since joining CrestClean they’ve nearly doubled the size of their business. “We are looking to expand further. We are hoping to take on some staff as we expand,” he says. They choose when they work and fit the work around their fulltime jobs. Going fulltime with their business is an option for the future, they say.